If you're interested in becoming a docent, you've come to the right place. At the McHenry Mansion, we offer a training program for volunteers who want to educate visitors about our historic home. Call or email us today for more details. When you sign up for our once-a-year docent training course, you learn how to be an informative tour guide for our location. This class typically starts in January and ends in March. Held from 9:30 a.m. to 11:30 a.m., the 8-week class covers all details of the McHenry Mansion. There will be a minimal charge for materials, and you must become a member of the McHenry Mansion Foundation. After you finish the program, you are then able to give tours at the mansion. A time commitment of 49 hours per year is required for each docent. If you are interested in this program, call or email us. The McHenry Mansion Merry Maids and Groomsmen program is comprised of a group of dedicated individuals who represent the mansion by giving classroom presentations at schools in our community and the surrounding areas. These professionals encourage students to visit the mansion. 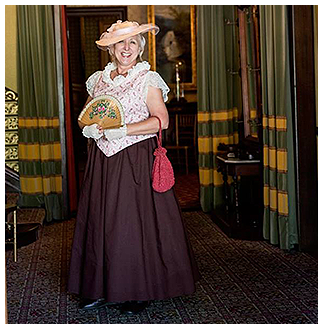 Dressed in period clothing, a team of two docents gives a brief history of the family and the house. They display photographs and historical artifacts that were typical to the era. The presentations last approximately an hour and give future visitors a fun, informational experience. It prepares them to ask questions and look for specific items spoken about in the house during their visit. There is no fee charged for the presentations. The group is also available to present similar programs to service groups and other interested organizations in the area when requested. During the 2017-18 school year, 27 presentations were given to 19 different schools. A total of 1,423 students participated in the program. Let us put on a presentation for your group by contacting us today. Volunteers are needed to keep the McHenry Mansion looking its very best. This group handles specialty cleaning such as polishing silver, dusting the artifacts, polishing the furniture and washing the prisms on the chandeliers. This group meets on the third Monday of every month at 9:30 a.m. Contact us today if this might be of interest to you! The guild is responsible for a number of fund-raisers such as the St. Patrick’s Day party. If organizing and working on dinners, teas, receptions is your thing, join the Guild. Contact us today. The Special Events Committee handles the 4th of July activities, the Dickens Faire, the McHenry Mansion Foundation Annual Meeting and the McHenry Manson Foundation Christmas Party. Same qualifications as above. Contact us today.